Good hair and make up artists are worth their weight in gold. These guys and gals can really help develop our subject, lifting and sculpting their overall appearance, sometimes in ways that we just couldn't imagine would even be possible. Good make up artists will help reduce time needed to address blemishes and skin imperfections, sharpen up lips, clean up puffy, tired eyes and develop and shape the face in post. Expert make up artists can draw out highlights, carve our cheek bones and apply all sorts of tricks and tips to skin to work to the concept of the shoot. Hair stylists, aside from also bringing creative weight to the shoot, will help catch stray fly aways, look for out-of-place strands, and help present the hair in a way that works for the overall look and concept. I’ve been fortunate enough to see and work with some very talented hair and make up artists in NYC since arriving here last year and I’m seriously in awe each and every time I see the transformation process unfold. 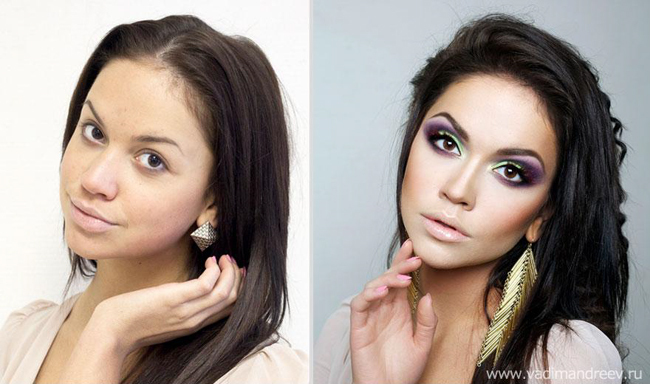 Griselle Rosario, one such skilled make up artist, produced the stunning before/after shot you see below. This shot is a simple before and after comparison shot, taken with an iPhone with no filters and no post work. Had I not been in the studio while at the time, and seeing the process unfold, I still would find it hard to believe. 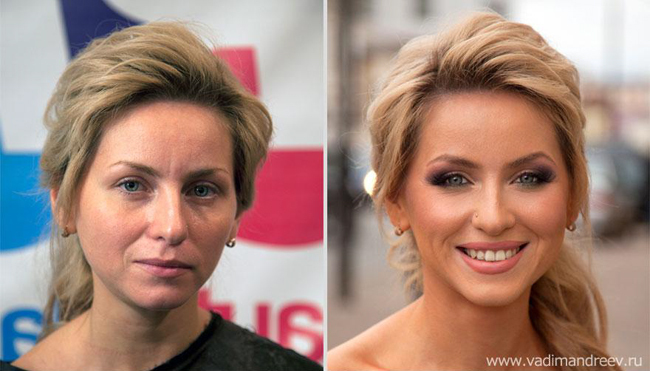 Before and after shots like these are becoming more and more common as a powerful tool in the make up artist's arsenal to demonstrate their skill set and abilities very quickly and with a high visual impact. 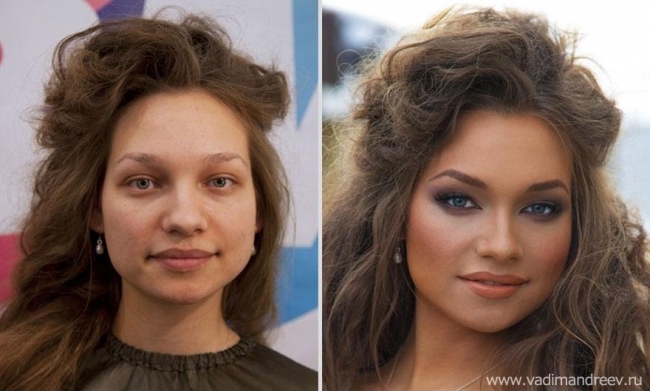 I make a point to tell any make up artist I work with to remember to take before and after shots like these if I don't see them doing it, because it's can be such a huge selling point for them to be able to show off their skill set. 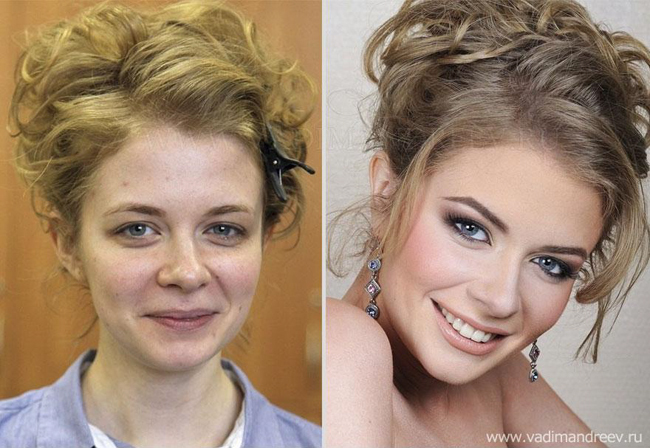 Russian hair and make up artist Vadim Andreev has produced some pretty staggering before and after shots which are currently doing the rounds online, and you can see why. While the style of make up and hair that Vadim has opted for might not be to your particular taste, there is little room to dispute the transformative effect that his work has on his subjects. Investing in dedicated hair and make up professionals can and will help lift your overall images, as well as save precious retouch time in post. If you are not doing it already, you can always try social media networking sites that aim to connect photographers with practicing make up professionals (or aspiring professionals) like Model Mayhem. 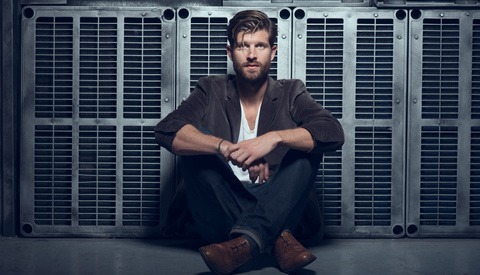 While these sorts of sites can present their own challenges which we won't get into in this article, they can and do present an opportunity to spot emerging talent, and to begin to build links with up and coming artists. Is getting good (and by virtue, usually expensive) make up artists on board something you do regularly, or just something you treat as an additional service if the client requests it? 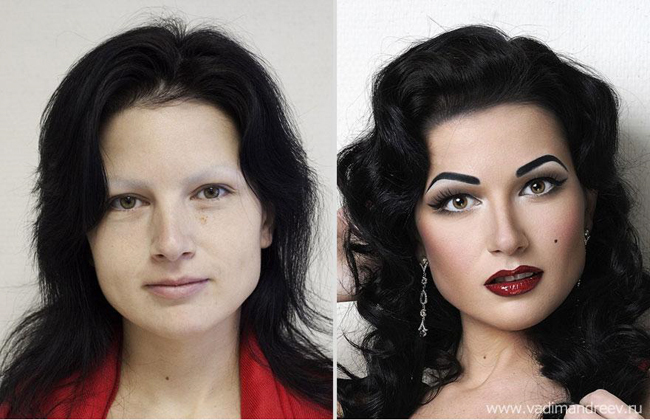 What make up stories do you have that have led to a great outcome on a shoot? I’d love to hear your stories and thoughts, feel free to leave them in the comments below. Great work..if true. I find it very hard to believe that some post work wasn't done though. Some of the jaw lines definitely look "liquified". Makeup drastically alters how our eyes perceive depth and shadows. 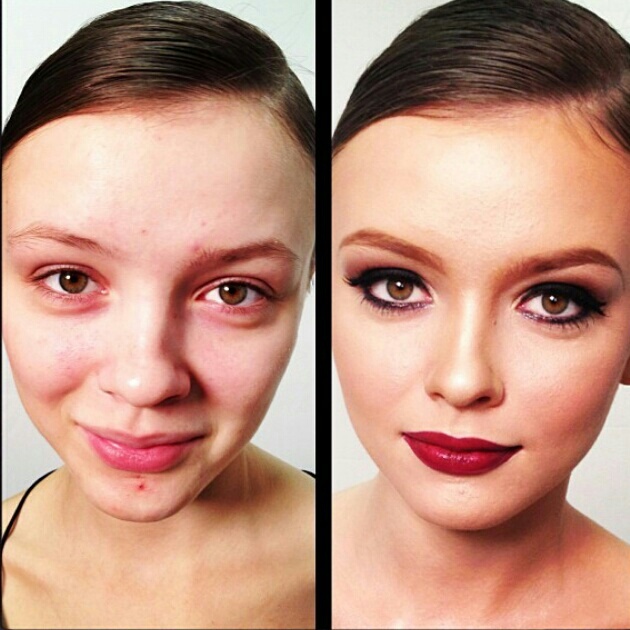 I can believe that's all makeup just by seeing what was done on a few episodes of "What Not To Wear." the light position moved slightly to be more flat in the after shot (you can see in the catch light and shadow on the nose) but it's still the same light and modifier. not different focal lengths, but further from the subject and with digital zoom (cropped). Also, the "before" shot was taken with a much wider angle lens and a higher angle than the after, which is why her eyes look buggier and her nose is more bulbous. Standard before/after trick (and the lighting too, of course). There is no need to call anything out. I take it as true if the process was observed from start to finish. The fourth set of images catches my eye most of all...a bit on the smooth side but then it's a web-sized image...and a mole has suddenly appeared. I agree with you. The first one is great, although there is also a change in lighting, as you can tell from the shadow. 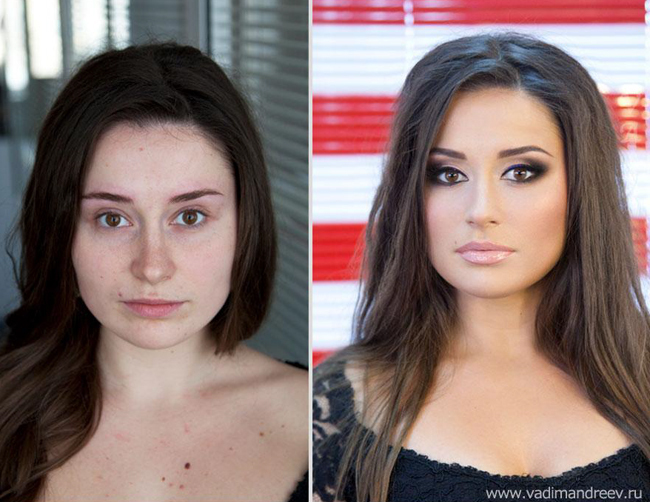 I'd say Vadim's work has been definitely been shopped. Look at the eyes: the color becomes brighter and more saturated and their pupils are sometimes larger, even though the light source is also stronger. The whites get a little brighter too. I'm not, however, denying the value of a good makeup artist. Good lighting, as well. amazing the power of make up and possibly a little photoshop to turn a slightly unattractive to normal looking woman into a drag queen. 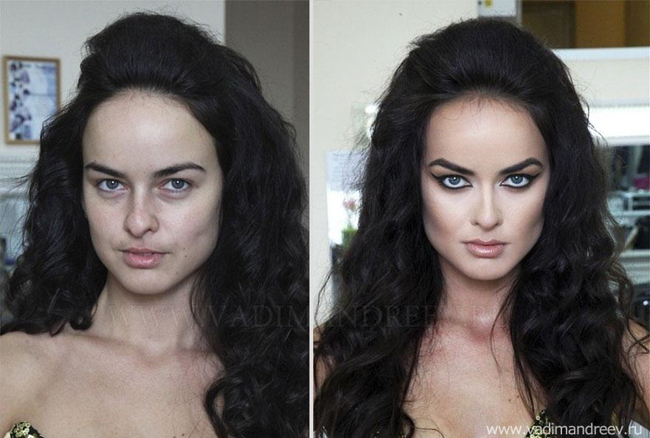 The beauty of contouring makeup. 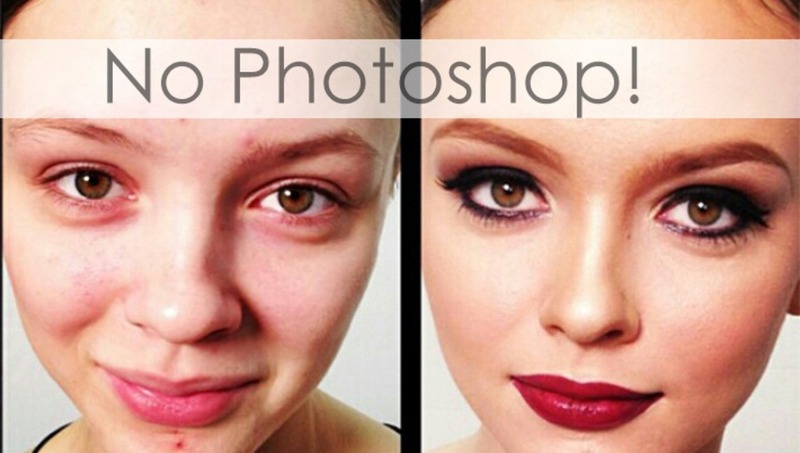 It's such a misconception that retouching makes the biggest difference. 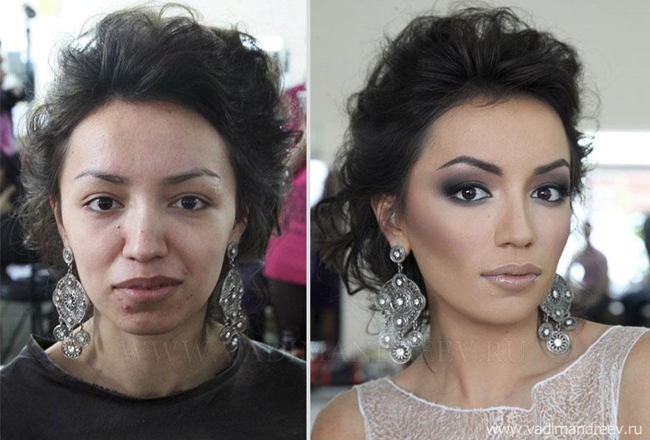 Makeup builds the foundations that retouching finesses. Ever seen real mugs of any of Hollywoods beauties ? Sigh. Sans makeup little remains that sets them apart from ordinary people. However it should not go unmentioned that the most important facial features are the eyes and the mouth. Large eyes and voluptuous lips. As is nicely depicted on the above images. It might not be enough evidence, but there is 'some' post work that happened on the blonde with a nose piercing (2nd to last model). If you pay attention to the before photo the stud is on her left nostril, but in the after photo it is on the right nostril. interesting and good spot. I would say you're probably right about the mirror (the 'before' image has what appears to be mirrored English language text behind her. Not sure if this is evidence of PS work on the model themselves, but as you say, does raise the interesting question of why mirror anyway? Maybe he just took one of the photos in a mirror... I do that often times, especially during "getting ready" at weddings and, unless you have some sort of refference (like a piercing, or printed text that shows etc), it's hard to tell the difference. Definitely mirrored. They all have their hair done the same in the before and after photos. The blonde, with the nose piercing-- her hair part is on different sides in each photo. Definitely mirrored. The blonde, with the nose piercing--hair part is on different sides in each photo. A great makeup artist is worth their weight in gold. Having a strong team of Hair, Makeup and Styling will take your photography to a whole new level. PS is a tool like any other and if used well compliments the work and shouldn't take over the edit. I have no proof (or reason) to dispute what Vadim has set out, but would be interested to hear your thoughts on the evidence for PS work. hmm, the whites on some of the eyes is unnaturally white. He must have used some white-paper on the models eyes if there isn't any PS involved !